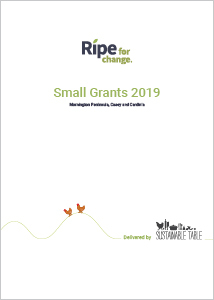 Ripe for Change is a place-based program offering community grants of up to $10,000, to improve our local food system and deliver health and sustainability outcomes for the population and environment. The Grants Program is currently focused in the Casey, Cardinia and Mornington Peninsula regions of Victoria, which represents a significant portion of Victoria’s food bowl. Ripe for Change is administered by Sustainable Table, a not-for-profit organisation campaigning for a food system that’s fair, healthy, humane and good for the environment. 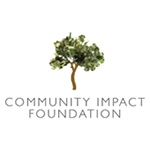 Funding has been generously provided by the philanthropic community, with 2019 marking the second time this Grant Program has been delivered. The pilot was launched in 2017-18, after an in-depth review of local food system challenges revealed that taking a place-based approach to philanthropic support would be the best way to empower community-led solutions. 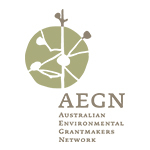 This research was undertaken in partnership with the Australian Environmental Grantmakers Network, with the full report and further reading available on their website. If you would like to better understand the Ripe for Change program and the philosophies that underpin it, then this video is a must! 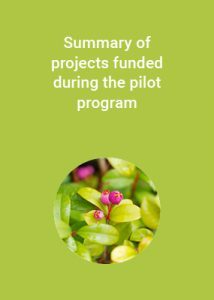 It features four of the twelve projects that received funding as part of our 2017-18 pilot program. As part of the Ripe for Change pilot program, experts were engaged to map our complex food system and determine the key Impact Areas to guide philanthropic engagement and support. These Impact Areas are being used to ensure that a cross-section of groups who drive food system improvements are represented in the granting process. Nature is integral to food production; with soil, water, bees, insects and birds all providing essential ‘ecosystem services’. With increasing threats such as urbanisation, environmental degradation, pollution and the added challenge of climate change, there is urgent work to be done to restore habitats and waterways and reduce the environmental impact of food production. An education and training program to help local farmers better manage their soils, improve soil health and reduce the need for synthetic fertiliser application. 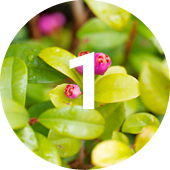 Field days to educate on the importance of growing native plants as a food source, habitat for native animals and supporting healthy environments. Many groups striving to improve the food system are testing new and innovative business models that ensure healthy and sustainable food is available and accessible to all. These types of social ventures are leading the charge to transform our food system, but they must be able to operate as viable businesses if they are to survive and thrive. We understand that when a business model incorporates a significant social or environmental benefit, it may take a little longer to deliver a financial return; this outcome area is designed in recognition of this. 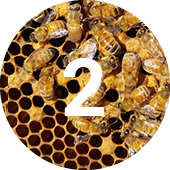 A social enterprise that encourages community inclusiveness or increases food access for disadvantaged members of the community; provides education/training; or raises awareness about local food system issues. 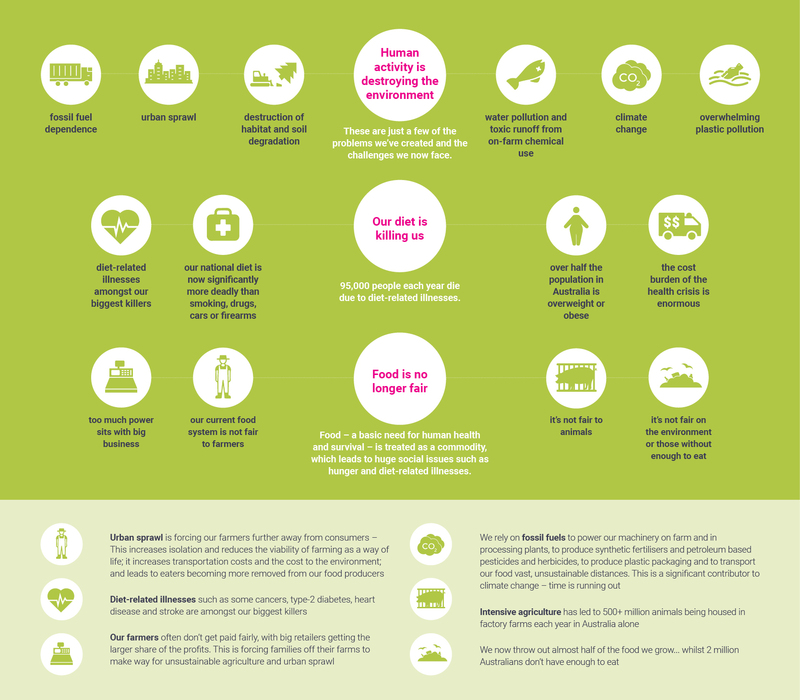 The food system should provide everyone with access to healthy, nutritious and culturally appropriate food, grown in an ecologically sound way; however, Australians experiencing disadvantage face greater barriers to access. 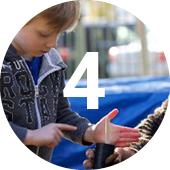 Making locally and sustainably grown, fresh food accessible to all, whilst also equipping people with the skills to embrace a healthier way of eating, improves community wellbeing and health outcomes. Establishing or expanding a community garden program. 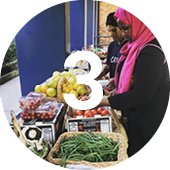 Engaging community members in workshops to improve their skills around the preparation of healthy, local, affordable and culturally appropriate food. Social movements and people power are the catalyst for systems change. Engaging with the broader community, educating people and inspiring action-based solutions is an integral part of improving our food system – we seek to support projects undertaking this important work at a grassroots level. A regional program or event that encourages participation in community education, awareness-raising or activism activities relating to food systems change. Eligibility criteria and conditions of funding. Funding applications of no more than $10,000 will be accepted, unless prior approval has been sought by the Grants Team. 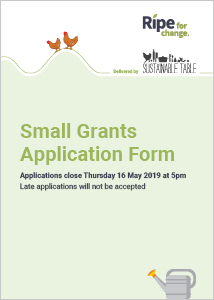 This grant is primarily for grassroots projects that need a little helping hand, however, if you have a big bold idea that you’d like to discuss we’d still love you to get in touch. If you can illustrate collaboration between groups to achieve a bigger impact, then it is possible that a larger funding request, split between the collaborating parties, would be considered. Contact our Grants Team to discuss. Projects must be based in, or work with communities based predominately in the Mornington Peninsula, Casey or Cardinia municipalities. The primary focus of your project must fall under one or more of the Ripe for Change Impact Areas. Not-for-profits, charities, schools or community groups (DRG status not mandatory). If you are a business or individual and would like to apply, you must be able to illustrate a clear environmental or social purpose (see Impact Area 2: Viable Enterprises). If you are unsure whether you or your business qualifies, please contact our Grants Team before preparing your application. 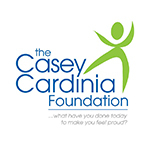 Projects that are not located in or predominantly working with communities in the region covered by the Mornington Peninsula Shire, Cardinia Shire or City of Casey. Projects must commence within 3 months of the allocation of funds. Funds must be acquitted on the project as described in the application, within 10 months of receipt of funds. 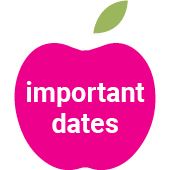 Acquittal reports are due on Thursday 30th April 2020, unless prior arrangements have been made with Ripe for Change. Application form and useful resources. Our food system supports and impacts every living system on earth. Without a healthy environment and healthy communities we cannot produce enough food. Without food there is no life. The time to act is now. The current situation looks pretty bleak, but with information comes the power to make a positive difference. Ripe for Change presents one of these opportunities by empowering community action and delivering solutions to the very real and very urgent challenges we are now facing. We know there are incredible people out there undertaking important work to improve our food system – we want to find these people and work with them to amplify the difference they are already making. Is that person you or your organisation? If so, please chat to us about applying for a grant. Keep me in the loop – Ripe for Change. Please enter your details if you'd like to receive Ripe for Change news and information.